The Spiritual Significance of Music is an exciting collection of exclusive interviews with many of the world's most visionary musicians and writers. A unique anthology that explores the dynamic relationship between music and spirituality, sharing incredible insights from their experience, knowledge and wisdom. This book embraces the beauty and diversity of music, providing readers with a tapestry of new thoughts on music and spirituality. Justin St Vincent has itnerviewed more than one thousand people, choosing over one hundred responses to produce a cutting-edge and ground-breaking project for our music-minded generation. Featuring exclusive interviews with Christian artists such as: Delirious?, Becoming the Archetype, Bride, Demon Hunter, Everyday Sunday, Kevin Max, Mortification, Parachute Band, Petra, Remedy Drive, Selah, Sonicflood, Sons of Korah, Stryper, Superhero, Take 6, Underoath. Plus exclusive interviews with mainstream artists such as: Guns N Roses, 1 Giant Leap, Arrested Development, Daniel Bedingfield, Devo, George Duke, Faith No More, Michael Franti, Ultra Nate, Bob Sinclair, Ravi Shankar. 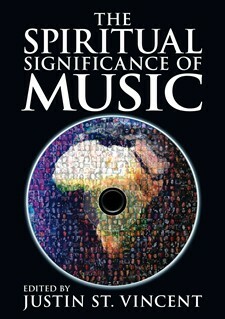 "I love The Spiritual Significance of Music... Everyone who considers themselves a musician will enjoy this book." "Music-makers and music-lovers will adore this inspirational book and cherish the wonderful words shared from musicians." "The Spiritual Significance of Music has done an incredible job of capturing the innermost personal thoughts, ideals, and concepts from many of today's most innovative cutting-edge musicians. Never before has there been such a conglomerate of different styled artists in one body of work speaking directly from the heart and soul." Justin St. Vincent has self-published four books including a worldwide trilogy exploring The Spiritual Significance of Music (2009-2012), and free eBook Love Live Forgive: Insights from Artists (2014). He is married to Sara-Maria and they are based in the beautiful suburb of Birkenhead, Auckland. Justin St. Vincent serves on the national Board of Promise Keepers New Zealand, is a committee member for NZ Christian Writers, Member of the New Zealand Society of Authors, and Associate Member of the Australasian Religious Press Association. Visit his website.